The Cook N Home 4-Piece 8 Quart Pasta Cooker Steamer Multipots, Stainless Steel includes an 8 quart stockpot, steamer insert, pasta insert/pot, and a tempered glass lid. Made of polished stainless steel with an encapsulated aluminum bottom for even heat distribution. Riveted handles for durability and tempered glass lid with steam vent to view food. Deep steamer insert can hold a large amount of vegetables, proteins, etc. 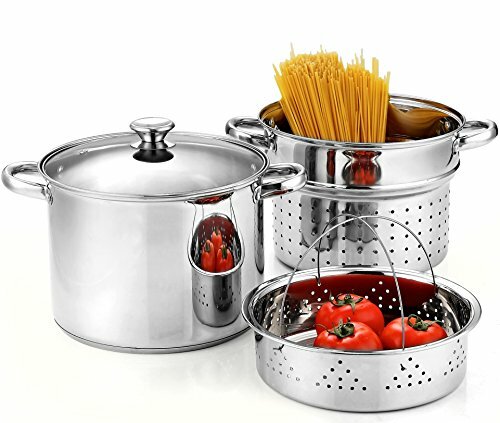 Pasta pot can cook a variety of noodles and can be used as a strainer. Induction compatible. Works on gas, electric, glass, ceramic, halogen, etc. Dishwasher safe.